Earn 13 Loyalty Points with this product. ? Sometimes, extra nutrients may be required to achive maximum health. FourFriends Joint Support is a dietry supplement that contributes to better joint health in smaller dog breeds. 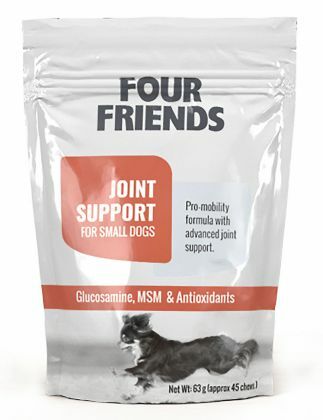 Hydrolyzed animal protein (chicken liver), oatmeal, rye flour, crustacean glucosamine 100mg, brewer's yeast, glycerin, methylsulfonylmethane 50mg, oats, fish oil 25mg, chondroitin sulfate 12.5mg, maltodextrin, citrus pectin, rapeseed oil, calsium sulfate.